Whispers in the Loggia: "If You Love Me"
As promised, below is a full translation of B16's homily at today's ordination of 29 priests in St Peter's Basilica. Today, in a very special way, the words that say “You have brought them abundant joy and great rejoicing” (Is 9:2) are realised for us. In fact, the joy of celebrating the Eucharist on the Lord’s Day is united with the exultation of Easter time on this sixth Sunday, and above all by the feast of celebrating the ordination of these new priests. Together with you I wish to warmly greet these 29 deacons who will shortly be ordained presbyters. I express my gratitude to all who have contributed to their journey of preparation and I invite all of you to give thanks to the Lord for this gift of these new pastors to the Church. Through our intense prayer, let us give them our support during this celebration in a spirit of fervent praise of the Father who has called them, the Son who has drawn them to Him, and the Spirit who has formed them. Usually the ordination of new priests takes place on the fourth Sunday of Easter, known as Good Shepherd Sunday, which is also world day of prayer for vocations, but this year that was not possible because I was preparing for my journey to the United States of America. More than ever, the icon of the Good Shepherd is one which highlights the role of ministers to the priesthood within the Christian community. But even the Bible passages offered to us for reflection by today's Liturgy illuminate the mission of the priest. The first reading from the Acts of the Apostles narrates the mission of Philip of Samaria. I wish to draw our attention to the phrase which closes the first part of the text: “There was great joy in that city”. This expression does not communicate a theological concept, or idea, but refers to an event; something has changed in the life of these people: in that city of Samaria, during the period of persecution of the Church of Jerusalem, something has taken place that has caused “great joy”. So what has happened? The sacred author narrates that, in order to flee the persecution that had broken out against all those who had converted to Christianity, all of the disciples, with the exception of the Apostles, abandoned the holy city and fled into the surrounding areas. From this painful event, a new impulse to spread the Gospel is mysteriously and providentially born. Also among those who had fled was Philip, one of the seven deacons of the community, a deacon like you, my dear ordinandi, even if in a different way, because during the unrepeatable season of the birth of the Church, the Apostles and deacons were gifted with an extraordinary power by the Holy Spirit both in preaching and in action. Now it is that the people of the city of Samaria unanimously welcome Philip’s call and, thanks to their adhesion to the Gospel, he was able to heal many of the sick. In that city of Samaria, traditionally despised and almost excommunicated by the Jews, the call of Christ’s Gospel resounds, opening the hearts of all those who listen to a great joy. That is why – St Luke emphasizes – there was great joy in that city. My dear friends, this is also your mission: to bring the Gospel to all, that all may experience the joy of Christ and that there may be great Joy in every city. What could be more beautiful than this? What could be greater, what could create greater enthusiasm, than cooperating to spread the Word of Life that communicates the living water of the Holy Spirit? Announce and witness this joy: this is the very heart of your mission, my dear deacons who will soon be priests. The apostle Paul calls ministers of the Gospel “servants of joy”. In his second letter he writes to the Christians of Corinth: “Not that we lord it over your faith; rather, we work together for your joy, for you stand firm in the faith”. These are words destined for every priest. In order to be collaborators in the joy of others, in a world that is often sad and negative, the fire of the Gospel needs to burn brightly inside each of you, that the joy of the Lord might live in you. Only then can you be messengers of this joy, only then will you bring it to all, especially those who are sad and disillusioned. Let us return to the first reading, which offers us another element for meditation. It speaks of a prayer gathering which takes place in the Samarian city evangelised by the deacon Philip. The Apostles Peter and John, two pillars of the Church who had come from Jerusalem to visit the new community and confirm it in its faith, preside over the meeting. Thanks to the imposition of their hands, the Holy Spirit came down on all those baptised. In this episode we see an early reference to the rite of “Confirmation”, the second sacrament of Christian initiation. For us gathered here today too, the reference to the imposition of hands is of great significance. It is in fact the central gesture of the rite of Holy Orders, through which I will confer upon you priestly dignity. This sign is inseparable from prayer, which is constituted by a prolonged silence. 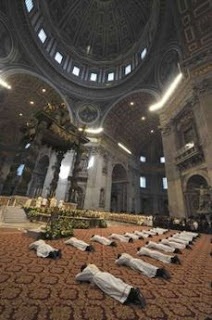 Without saying a word the consecrating Bishop, followed by the other priests who are present, places his hands on the heads of the ordinands, thus expressing our invocation that God infuse them with the Holy Spirit, making them participants in Christ’s priestly ministry. It is a matter of seconds, the shortest of times, but filled with an extraordinarily dense spirituality. My dear Ordinandi, in the future you must frequently return to this moment, to this gesture which while not magic is rich in mystery, because this is the origin of your new mission. In that silent prayer two freedoms meet: the freedom of God, working through the Holy Spirit, and the freedom of man. The imposition of hands expresses the specific nature of this meeting: the Church, represented by the Bishop who stands tall with his hands outstretched, who prays that the Holy Spirit consecrate the candidate; the deacon, who kneels, receiving the imposition of the hands and who entrusts himself to the mediation. The union of these gestures is important, but the invisible movement of the Spirit which it expresses is infinitely more important; a movement that is perfectly evoked by sacred silence, which embraces all, internally and externally. We find this mysterious Trinitarian "movement," which guides the Holy Spirit and the Son to dwell in the disciples, in today’s Gospel passage. Here it is Christ himself who promises to pray to the Father to send the Spirit, described here as ‘another Advocate’ down upon his followers. The first Advocate is in fact the incarnate Son who came to defend man from the antonomastical accuser, who is Satan. In the moment in which Christ, his mission fulfilled, returns to the Lord, they send the Spirit, as Defender and Consoler, that he might always remain with the faithful, to live within them. Thus, through the workings of the Son and the Holy Spirit, an intimate relationship of reciprocity is created between the Father and his disciples: Christ says “that I am in my Father, and you are in me and I in you”. All of this, however, depends on one condition that Christ makes at the very beginning: “If you love me”. Without love for Christ, which lies in the observance of his commandments, the faithful excludes himself from the Trinitatian movement and begins to fall back on himself, losing all capacity to receive or communicate God. “If You Love me”. Dear friends, these words were pronounced by Christ during the last supper at the moment when he instituted both the Eucharist and Priesthood. While addressed to the Apostles, in a certain way they are also addressed to all their successors and to priests, who are the closest collaborators of the successors of the Apostles. We hear them again today as an invitation to live our vocation to the Church more coherently: you, dear ordinandi, hear them with particular emotion, because today Christ makes you participants in his priesthood. Receive them with faith and love! Let them be imprinted in your heart, to accompany you along your lifelong journey. Don't forget them, do not lose them along the way! Read them over and over, mediate on them often and above all pray over them. So you will remain faithful to Christ’s Love and you will become aware with an ever new joy how His Divine Word will "walk" beside you and "grow" within you. An observation, too, on the second Reading: it's taken from the first Letter of Peter, above whose tomb we find ourselves and to whose intercession, in a special way, I entrust you. I make his words my own and, with affection, with them I send you forth: "Adore the Lord, Christ, in your hearts, always ready to respond to whoever seeks account for the hope that is in you" (1 Pt 3:15). Adore Christ the Lord in your hearts: that is, carve our a personal relationship of love with Him, love him first and greatest, only and totally in that which lives, purifies, illumines and makes holy all your other relationships. The "hope that is within you" is linked to this "adoration," to this loving of Christ, that through the Spirit which, we might say, lives in us. Our hope, your hope in God, in Jesus and in the Spirit. Hope that from today is born in you a "priestly hope," that of Jesus the Good Shepherd, who lives in you and gives shape to your desires in the mold of his divine Heart: hope of life and forgiveness for the people who will be entrusted to your pastoral care; hope of holiness and apostolic fruitfulness for you and for all the Church; hope of openness to faith and to the encounter with God for the many that will draw near to you in their seeking of the truth; hope of peace and comfort for the suffering and injured of life. Dearest ones, here is my wish in this day so important for you: may the hope rooted in faith always and ever more be yours! May you always be witnesses and wise and generous givers, sweet and strong, respectful and confident. May you be accompanied in this mission and protected always by the Virgin Mary, who I exhort you to welcome anew, as did the apostle John beneath the Cross, as your Mother, the Star of your life and your priesthood. Amen!